Academic museum professionals share a vision. We are committed to enriching higher education through excellence in teaching, cross-disciplinary collaborations, and creative integration of the museum into student life. We care about our audiences on campus and beyond, reaching out to multiple communities with innovative programming and educational collaborations. We are passionate about stewarding our collections, increasing access to our museums and their holdings, sharing our research, and organizing thoughtful and challenging exhibitions. We value object-based learning in an increasingly virtual world and teach close looking in an age of rapid intake. And we look to the future as our missions expand, fueled by the belief that both museums and universities can be hubs of creativity and innovation. 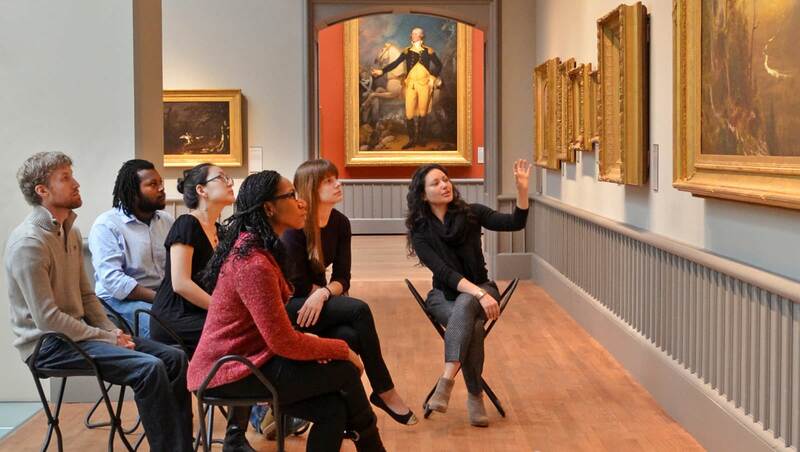 Leaders from across the college and university art museum field gathered at Yale from May 8 to 10, 2014, for a focused consideration of the curatorial contribution, educational potential, and changing audiences of campus museums. We thank our panelists and attendees for their participation. Conference made possible by the Samuel H. Kress Foundation, the Lydia Winston Malbin Fund, the Manton Foundation Public Education Fund, the Nolen Center for Art and Education Endowment Fund, and the Nolen-Bradley Family Fund for Education. The Gallery is committed to making our collection, exhibitions, and programs available to as wide an audience as possible. We invite you to watch the conference panel videos below, view photos from the weekend in our flickr stream, and download conference materials. The opening session of the conference, “Engaging Audiences,” was chaired by Molleen Theodore, Assistant Curator of Programs at the Yale University Art Gallery. Panelists included: Marla Berns, the Shirley and Ralph Shapiro Director, Fowler Museum at UCLA; Aimee Chang, Director of Engagement, Berkeley Art Museum and Pacific Film Archive; Luis Croquer, Deputy Director of Exhibitions and Collections, Henry Art Gallery, University of Washington; Tess Korobkin, graduate student, History of Art, Yale University, and Wurtele Gallery Teacher, Yale University Art Gallery; and Cyra Levenson, Associate Curator of Education, Yale Center for British Art. The second panel of the conference, “Teaching and Learning with Art,” was chaired by Elizabeth Manekin, Assistant Curator of Education, Yale University Art Gallery. Panelists included: Ellen Alvord, the Weatherbie Curator of Academic Programs, Mount Holyoke College Art Museum; Jim Harris, the Andrew W. Mellon Foundation Teaching Curator, Ashmolean Museum of Art and Archaeology, University of Oxford; Sarah Lewis, Yale School of Art faculty and author of The Rise: Creativity, the Gift of Failure, and the Search for Mastery (Simon and Schuster, 2014); Eric Segal, Education Curator of Academic Programs, Samuel P. Harn Museum of Art, University of Florida; and John Walsh, Director Emeritus, J. Paul Getty Museum. The third panel of the conference, “Curators and Education,” was chaired by Laurence Kanter, Chief Curator and the Lionel Goldfrank III Curator of European Art, Yale University Art Gallery. Panelists included: Kelly Baum, the Haskell Curator of Modern and Contemporary Art, Princeton University Art Museum; Cindy Burlingham, Deputy Director, Curatorial Affairs, Hammer Museum, UCLA; Dabney Hailey, independent curator; Anne Rose Kitagawa, Chief Curator of Collections and Asian Art and Director of Academic Programs, Jordan Schnitzer Museum of Art, University of Oregon; and Martha Tedeschi, Deputy Director for Art and Research, Art Institute of Chicago. The fourth session of the conference, “Curating Contemporary Art/South Africa,” was chaired by Kate Ezra, the Nolen Curator of Education and Academic Affairs, Yale University Art Gallery, and included the student curators of Contemporary Art/South Africa and artist Mikhael Subotzky. The final session of the conference was a roundtable discussion chaired by Jock Reynolds, the Henry J. Heinz II Director, Yale University Art Gallery. Panelists included: Sharon Corwin, the Carolyn Muzzy Director, Colby College Museum of Art; Thomas Lentz, the Elizabeth and John Moors Cabot Director, Harvard Art Museums; Christina Olsen, Class of 1956 Director, Williams College Museum of Art; Michael Taylor, Director, Hood Museum of Art, Dartmouth College; and Simone Wicha, Director, Blanton Museum of Art, University of Texas at Austin.